Odisha: The premier medical institute of the state, VIMSAR (Veer Surendra Sai Institute of Medical Sciences and Research) is again under threat of boycott of work by the Junior Doctors. Only yesterday, the members of the Junior Doctors’ Association (JDA) of VIMSAR wore black badges on duty as a sign of their protest. Their agitation this time is to press their demands raised earlier. These black badges were worn by the junior doctors as they want the government to fulfill their nine-point charter of demands at the earliest. They have now set a deadline of March 31, failing which they will resort to a strike from April 01 at the college premise. As reported by Odsihasuntimes, The JDA threatened to resort to cease work again from April 1 if their demands are not fulfilled by the end of March. Notably, the JDA had resorted to cease work from January 12 demanding fulfillment of their demands. 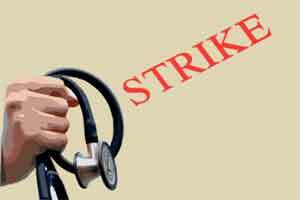 With participation of 450 junior doctors and house surgeons in the cease work agitation earlier, patient care services were completely paralyzed in the premier medical institution. As reported by MD team earlier, Sciences and Research (VIMSAR) here today suspended their 10-day-old strike following a meeting with the Health Minister.